So the mistake by Nakamura which upset me the most, was the damage to the leather interior that Cesar had worked on, taking several months to do so. I mean, my car would be the first R33 GTR in the world to have a hand built, bespoke interior, and I was really looking forward to getting the car back and showing it off in its full glory. Unfortunately, because Nakamura KEPT THE CAR 6 MONTHS!!! by the time I got it back, at least one tuner here in Japan had started offering a full leather interior as an option. While I've previously shown the two bumps on the front, and explained why, I found these pictures on my phone which show you how those bumps came to be. So you can see that these screws were actually cut SHORTER than they originally were. In other words, Nakamura KNEW that they were too long, and instead of leaving the bracket loose or come up with some other way, went ahead and drilled away. Never mind that the screw tips were cut unevenly, thus resulting in a knifelike edge. In any case, these two screws caused the glovebox front to gain these two dimples, likely due to plastic from the glovebox door being forced into the leather. Anyway, once I had discovered these two screws to be the cause of the two dimples, I emailed Cesar (the guy who did the bespoke leather work for me, just in case you didn't follow the project earlier) for advice on what I should do, hoping maybe the application of a heat gun might be enough to fix the problem. But unfortunately, the glovebox door wasn't the only item that needed to be redone. 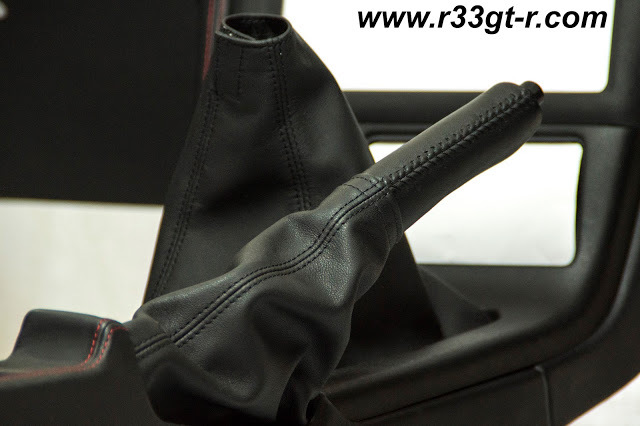 As I mentioned here in my blog, while Cesar had initially used red stitching on the handbrake boot, after we consulted we decided to switch back to a boot using black stitching, in order to match the OEM look. In any case, Cesar had included both the red stitch and black stitch versions of the handbrake boot, just in case I later changed my mind. Unfortunately, while Nakamura had my car in his custody, he THREW OUT this custom black stitch boot, presumably thinking that the above black one was the OEM one... AGAIN WITHOUT TELLING ME. FUCKER. So when I got the car back, it had the red stitch but no sign of the black stitch boot (I even looked in his pile of junk but couldn't find it). Left side green arrow points to the red stitch handbrake boot. Right side shows unfinished key surround. So, Cesar also kindly offered to redo the handbrake boot, using the Bentley leather, with black stitching. Further, he offered BOTH A REDONE GLOVEBOX DOOR and HANDBRAKE BOOT at NO CHARGE. CAN YOU BELIEVE HOW NICE HE IS?? Of course I wasn't going to allow that...(so yeah of course I paid him - totally worth it). In any case, I sent him the damaged glove box door and the red stitched boot, a few short weeks went by and voila! A box from Mexico appeared at my front door. Of course I had to wait for the weekend to open it up and enjoy perfection, but I was not disappointed. The two handbrake boots! The red stitch one I had removed and sent over as a template, and a brand new black stitch one! And of course, the redone glovebox. Isn't it beautiful? So of course, I jumped to fix as much as I could. First, I installed the black stitched parking brake boot. Unfortunately no pictures of the install, but here is a better photo of the tab that I discovered had been snapped off when I removed the red stitched boot. I used some plastic epoxy type glue, hope it holds but even if it doesn't the leather keeps things together... for now. The bigger problem, at least for me, was how the glovebox door had become deformed due to the wiring needed for the ETC reader and the boost controller, that Nakamura had routed in the back. 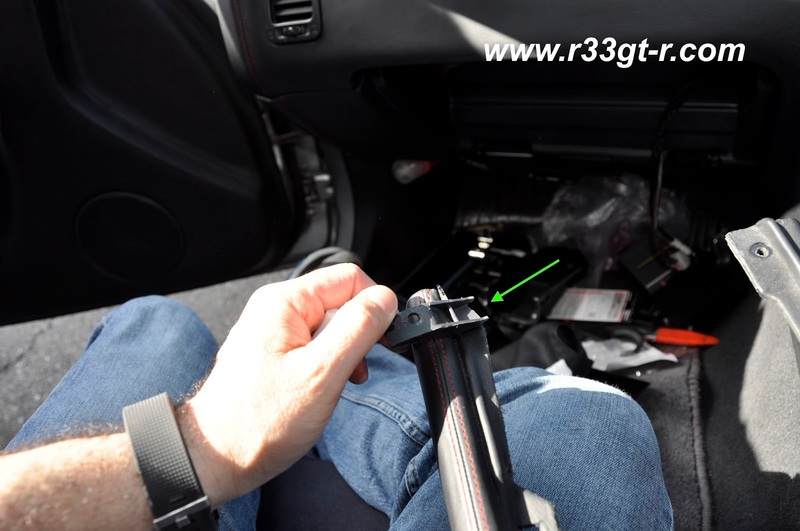 As a reminder, previously the ETC reader had been in the center console, and further the wiring for the boost controller did not have heat shrink wrap around it - meaning that those cables could be passed through into the glovebox in a fairly flat way. But Nakamura's method of bundling cables for both devices now caused the front right side to sag. Given the newly repaired glovebox door, I wasn't going to rush trying to figure out how to fix this panel gap. Initially, I tried to be very gentle. First, I used some spare weights to hold up the sides while putting pressure on the middle section, where the latch mechanism is. I left this in a sunny room, hoping that the warmth would gently allow the weights to deform the glove box back into the proper shape. I figured if the latch mechanism was pushed outwards, the ends would be pushed upwards. In other words, I wanted to purposely have the ends too "tight" so that the latch would how the door closed snugly. Unfortunately, after about a week, when I tried out on the car I did not see much progress. There appeared to still be about a millimeter of give on the right side where the gap was. So, I decided to use a heat gun. Being VERY careful not to melt anything. I would heat up, and at the risk of burning of my fingers, try to bend the sides back up. 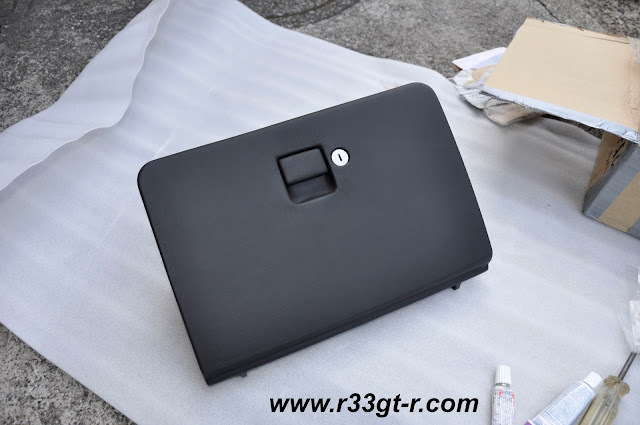 I repeated this, sometimes even removing the glove box door in order to put more pressure on the sides. Ok I took the photo at night - actually just a few minutes ago - sorry about the resolution but I was too excited not to share this with everyone. Finally looks flush, and there are no rattles either ! So am I done with fixing the damage done by Nakamura at WORX? Not quite, and I have a few more posts coming up soon to explain. Being a reader on your blog for all of your posts, I have never seen you being that angry before like this time. Understandable as I would probably reacted the same way if my car suffered these things after it was entrusted to someone who is supposed to make the car better. Not only that he did not make it better, the final result is worse than how it was before, especially on the glovebox part. The two bumps and deformed glovebox door is not something that should be overlooked by a 'professional' guy. I was actually quite shocked when I first read about your complain post back in April. Anyway, it seems like the progress of rectifying the mess is going quite positive so far. I hope you will be able to get everything back to normal again or even better than before. You will always have my support. Good luck and all the best, Aki. Kadir here. Sorry I have not commented here in a while. I make it a point to read your blog and always check for updates. I am glad there is light at the end of the tunnel! Cesar sounds like a true gentleman. The other guy at Worx; not so much. I can only begin to imagine your frustration with him. I remain shocked by his antics and all the nonsensical stuff he got upto whilst in possession of your car. I am sure he will get his comeuppance at sone point. If that is how he operates well he wont last much longer surely.. Still a cracking BCNR33 and easily one of my favourites. I look forward to the next instalment. And well done for not beating him to a pulp or stir frying him to high heaven. Not that he doesn't deserve it!!! I wonder if Nakamura at Worx's treats all his customers the same way he treated you. Threw away your belongings without notifying you, overriding your instructions and not offering to rectify the problems he caused. I really wonder if this is his normal attitude or if he has a personal issue with you (totally not saying anything against you, wondering if he developed a dislike for you, somehow, over time). Either way, I always imagine the majority of the Japanese to operate under the "customer is always right" mentality. Furthermore, I can imagine you going through his trash looking for your expensive belongings, after handing him a large cheque would be very insulting. Anonymous - well I think most of his customers want relatively simple work done. In my case, I would like think he simply got carried away, and either thought I was rich and didn't care, or he had the arrogance to believe that all of his actions were correct. 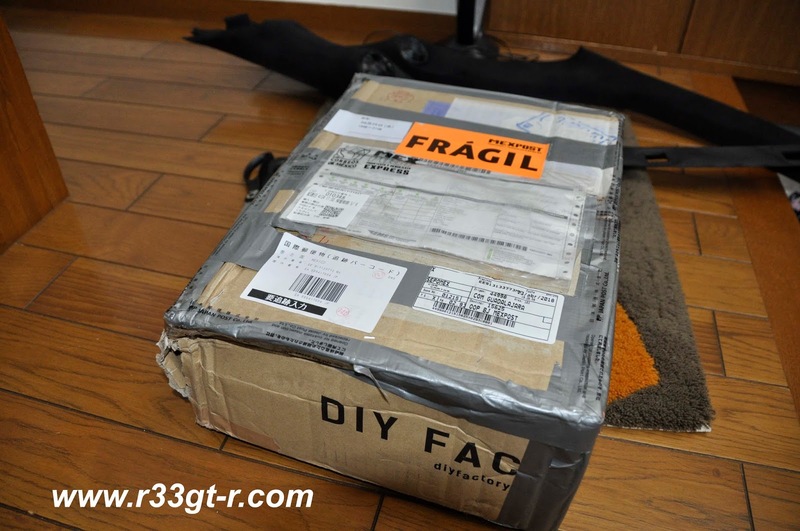 And yes, most Japanese do think of the customer is always correct - further each time I go somewhere to replace something (not just car related) I'm usually handed the old/damaged item back in a separate bag or package, so I can see that the work was actually done (to replace that bad part). Anyway, thanks to everyone for your words of support! You guys truly keep me going. Good job on the glovebox!